You are here: Home / EU - Regulating Biking / Is The Sky Falling In? 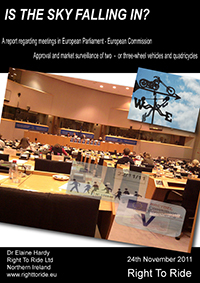 On Tuesday the 22nd November 2011 Right To Ride’s Elaine Hardy went to Brussels for meetings concerning the European Commission’s proposed EU Regulations for motorcycles. Elaine met with a Representative of the European Commission, the assistant of UK MEP Malcolm Harbour, chair of the IMCO committee and chatted with Malcolm Harbour himself. On the same day there was a protest ride by British motorcyclists around Brussels and Elaine wondered if these riders believed that the sky was falling in on motorcycling. Talking through the raft of issues in the proposal, views were exchanged about ABS brakes, reduction of casualties, the on/off switch, modifications and Article 18 which deals with measures regarding modifications to the powertrain of vehicles. With regards to anti-tampering, Elaine explained to the EC representative that because the Commission had not identified specifically what would be included in article 18, this had caused considerable concern amongst motorcyclists and in effect was the principle reason that a protest ride was being held in Brussels that day. Elaine explained to the EC representative about the modifications required for disabled riders and in fact gave him a list provided by Rick Hulse and showed him documents concerning the work that is done in the UK by the National Association of Bikers with a Disability. He told Elaine that the position of the Commission is that such useful modifications will be dealt with through the member states either through type approval or SVA as is the case today. In general the anti-tampering measures will be limited only to prevent harmful modifications of the powertrain with regards to the functional safety and environmental performance of vehicles. (e.g. drilling holes in the exhaust pipe or modifying an exhaust for the purpose it was not intended for). Customising vehicles will also remain possible after the new legal package to approve vehicles will become applicable and the national SVA schemes dealing with modifications of individual vehicles in the Member States will continue to exist as they do today. The time frame for the introduction of these measures which will apply only to new vehicles was mentioned. (The proposal will not apply retrospectively to any vehicle). “It is important that we listen to the views of bikers who also want safer and more environmentally-friendly bikes. We must ensure that the regulation takes into account their concerns. We have already carried out a great deal of work to ensure that bikers can continue to make improvements to their bikes using a wide range of parts. I am confident that their viewpoint on ABS and on-board diagnostics will also be taken into account when we agree the final text. So is the sky falling in? MAG Ireland have reported that they have met with Noel Brett of the Road Safety Authority. With regard to the type approval/framework regulations, MAG Ireland report that they learned that the RSA has sought clarifications from IMCO regarding Article 18 and are awaiting a reply. MAG Ireland explained the concerns of our members surrounding custom built bikes and the impact of the anti-tamper provisions in the EU proposals. The RSA has told us that they are broadly happy with of the present situation regarding custom & one-off builds, and sees no reason to alter that. A MAG Ireland delegation will be meeting with Minister for Transport, Leo Varadkar early next month to further pursue the issues at the highest levels. Claims that a new EU law will “suppress” the freedom of motorbike riders is “complete nonsense”, says a senior Conservative. Malcolm Harbour chairs the committee in the European Parliament which has been examining plans for a new EU law to deal with motorbike safety. But Conservative, Malcolm Harbour, says politicians have listened to bikers view and the new law will make bikes better and safer.